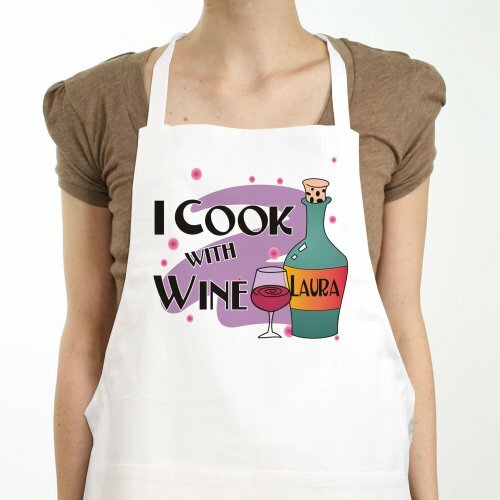 Show off your love of cooking and fine dining with our Personalized Aprons. Everyone will want to try your latest dish featuring your latest favorite wine. Your Cook With Wine Personalized Chef Apron is a full length, 65/35 cotton/polyester twill fabric apron with matching fabric ties. Machine washable. This custom bib apron measures 20" Wide x 30" Tall and features multiple pockets for convenient storage along with an adjustable neck strap for a comfortable fit. Includes FREE Personalization! 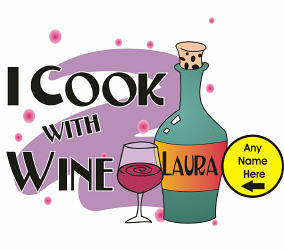 Personalize your Cooking Apron with any name. This item is very cute! Love this too! Lots of compliments. Perfect gift for the wine coniseuer! My sister loved it! Our Personalized Aprons are perfect for Christmas, Mother's Day, Father's Day, Sweetest Day, Valentines Day & Birthdays. Create a Custom Printed Apron for someone in your family today. Mom, Dad, Grandma or Grandpa will love this wonderful apron which you have personalized just for them.